Posters for upcoming SALC workshops are now visible around campus. Please encourage your students to attend. The first two sessions are being run by learning advisors and are introductions to regular weekly activities. 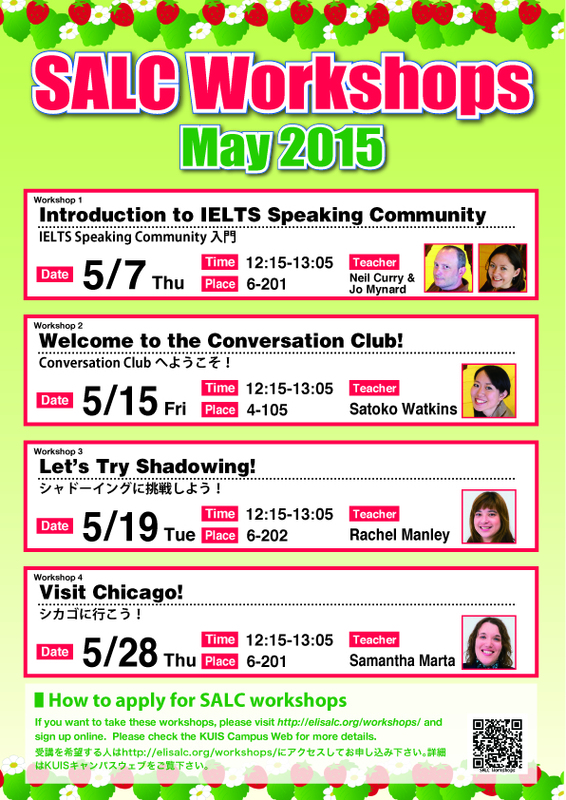 The IELTS Speaking Community is a weekly event that we hope will eventually be run by students for students. Even if students aren’t planning to take IELTS, students wishing to discuss academic topics in a supportive environment are welcome every Thursday in 6-201. The Conversation Club is open to all students and runs every Friday lunchtime. It’s a friendly and supportive session where students set the topics and organise participants into small groups. Learning advisors attend and support the group. The second two workshops are being offered by ELI teachers and promise to be fun and lively sessions introducing students to strategies for learning, and an interesting insight into American culture. This is a brief update – posted in a quiet moment between SALC orientations! We have already conducted orientations with 25 freshman classes and we have 20 more to go to reach everyone. It seems that the students are enjoying being in the SALC and are coming back regularly to use the facilities and chat with other students, learning advisors and teachers. We have tried out a few new orientations activities this time. If you have any feedback or suggestions for us, please pass them on to any of the SALC team members (or email salc@kanda.kuis.ac.jp). If you would like to schedule another SALC orientation for any of your classes, also please get in touch. The SALC is offering four, one-credit courses this year and 120 students from various departments have registered. 1. The Study Abroad meet up: lunchtime Thursday (23rd) at the yellow sofas. If any of your students have just come back from studying abroad, we will warmly welcome them back to the SALC and ELI Lounge. Other students interested in finding out more about their experiences can come along too. See flyers. 2. Friday lunchtime conversation club (Room 4-105). This is a regular event. See the posters for details. 3. Friday evening freshman welcome party (Balcone). See the posters for details. We have updated our SALC app for the new academic year and are inviting students and colleagues to down load it (on campus only). Feel free to invite your students to download the app by following the link provided on Campus Web. If you are not a freshman English teacher, but would like to arrange an orientation for your class, please get in touch (salc@kanda.kuis.ac.jp). What is the Self-Access Learning Centre? How can we promote learner autonomy? How does the SALC support learners? How can teachers use the SALC? The slides can be viewed here.